I didn't know about that one I never had this particular single thanks for setting me straight Harry I now stand corrected. Yes indeed they truly are however they do make interesting collectibles though. If you look at the titles, it's a rip-off of THE BEAT OF THE BRASS, with added songs, but that's not what brought me to post this. I was reading something elsewhere about streaming music, and thought I'd revisit Pandora, the only streaming "service" I'd ever signed up with. 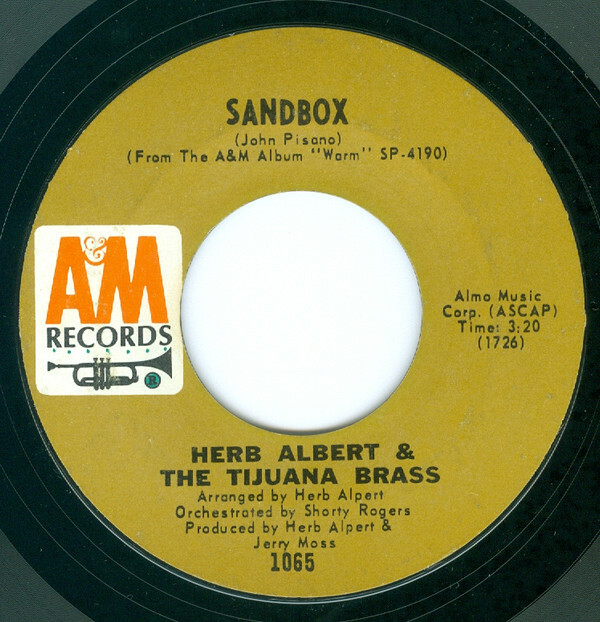 A few years ago, I played around with it and set up a station around Herb Alpert & The Tijuana Brass. So I found my way in and started up the "station" and was treated to the Mort Stevens "Hawaii Five-O Theme" and then "Bittersweet Samba" and something else I don't recall at the moment. Following that it was back to Herb and "This Guys In Love With You", and the image above appeared on screen. As I listened - I had headphones on - it sounded weird. Herb's voice was coming from both channels, but not in sync or something. Usually on this track, in headphones, Herb's voice is centered, as if inside your own head, but here I was hearing him on the left and again on the right. 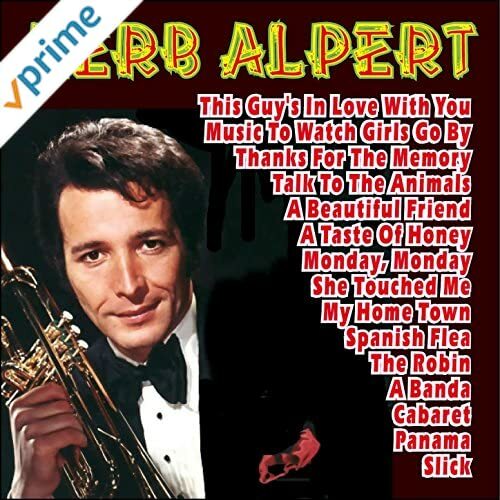 Checking out the Amazon listing of this "album" where it's available as a download, I found that indeed, the file they are selling - or at least using as a demo - has that weird - almost duophonic sound to it with Herb's voice coming from two locations. Checking other songs from the source on Amazon, it seemed that all of the tracks from THE BEAT OF THE BRASS sound that way, with Herb's trumpet coming from a dual location. In other words, whoever put this abomination together first futzed with the sound, you know, one of those "I can remaster this at home and make it sound better" types. There are all kinds of filters with sound-editing software that can mangle a track like this, and it's obvious to me that that's what was done here. Just another reason to avoid this kind of counterfeiting. I've noticed before that that collection contains a non-Herb track ("Music to Watch Girls By") but I don't think I spotted until today, that they didn't even get the title of that song correct! Exactly And I notice something amiss just listening to the samples I still remember the ripoff of TJB volume 2 called " Spanish Harlem & Other delights" from a few years ago which also had tracks from The Lonely bull and hearing the samples they all sounded like they were in mono but not true mono they sounded like the left channel which had the main trumpet and the other instruments faintly in the background and at the time volume 2 wasn't available in physical CD but to me it was a cheap counterfeit just like the above Abomination thankfully I never purchased Any of it so I'm glad I held out for the authentic Cd/download releases which are Spot on. My wife always jokingly asks me: "How many versions of this do you have?" I'm going to bet this is a way to trick the automatic copyright protection filters on YouTube and elsewhere--if they can do some phasey tricks to the sound, it may throw off the automatic detection as the sound is changed enough to prevent a match. I agree They seem so desperate to get these rotten bootlegs out it seems they are using every kind of Trickery audio and otherwise to do it.